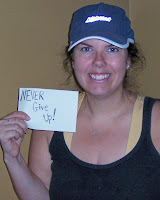 My sign says "Never Give Up!" *I will be so excited if I make it into the 180's next week. I have yoyoed between 194-190 for months! 18 Miles tracked this week: 6 treadmill, 12 cycling. I am a little short on my weekly mileage goal of 20miles, but I had to take some days off while I was sick. Goal 2: 5k in under 40 mins - Starting Couch to 5k again working on speed during run interval :Week 2 finished. Goal 3:Journal food 5days a week- Journaled using Sparkpeople 4 days. There were a couple days I felt so bad I didn't eat much. On those days I didn't journal. I am proud of making my Doctor's appointment at the first sign of feeling sick. I am bad to wait around thinking I will feel better in a day or so,only to end up feeling worse for much longer. This week I nipped those ear and throat infections in the bud before that got too bad. After being sick, my house is a WRECK! I MUST get things back in order, including cleaning out my fridge!! Good luck on seeing the 180's! Go for it! I know what you are saying about yoyoing between certain numbers. I have been between 162 and 168 for over 3 months(after losing 65 lbs)!! But I think I am starting to get things figured out. I hurt my ankle and now it is time to concentrate on how to beat this plateau!! You are doing great. Keep it up! Ooh, mud mask! I recently discovered those, and I am completely in love. It's my new TGIF treat! Congrats on the weight loss--it feels awesome to break into a new "decade"--I'm pushing my next one, too. Fingers crossed. You are doing awesome Jess - keep it up! I find Sparkpeople is great for journalling (says the girl who hasn't used it since Thursday). For me it's all about... Back on track, back on track!, this week. Bravo for making that doctor's appointment right away. Prevention can be the difference between a short illness and a chronic condition. Your goals look great. Enjoy your mud mask! Congrats on the weight loss! That mud mask sounds really good! It's important to do nice things for yourself!! You're so close to the 180's! Congrats! Nice post and recap, you are doing well, congrats. Wish you all the best. Three Things Thursday with a cherry on top!